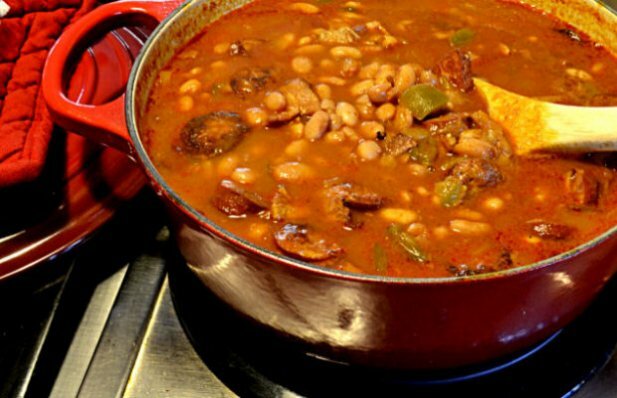 A delicious Portuguese beans and linguiça dish that I am sure most will enjoy. Soak the beans overnight. This step can be skipped but the amount of water added will increase significantly. If you use this latter method start with two inches of water over all prepared ingredients and add more as needed as the beans cook. Cook the bacon, not to crisp, in a dutch oven and drain off excess fat. Add chopped onion to the bacon and continue cooking. Add bell pepper and cook until pepper begins to soften. Add soaked beans and water. Turn burner to medium heat until the beans begin to boil. Turn the heat to low for simmering heat. Add tomato sauce and the spices. Hold salt and pepper for now. Cover and cook until beans are tender. Depending on the soaked beans or not this could take several hours. Remember to check from time to time to add water as needed. Slice or chop the linguica. Cook over medium heat until slightly brown. This process will remove some of the excess fat. Drain after cooking. Add linguica and continue cooking. After about 30 minutes check for need of salt and pepper. Add as needed.